This machine is truly a monster when it comes to inflatables. 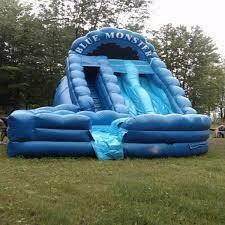 Standing 18' tall and more than 25' long our Blue Monster Water Slide will shock and awe your party guests. It is a fully functional dual lane water slide that not only provides unlimited fun but cools you off during those intense summer parties. Kids and adults love racing each other down the slide into the oversized lagoon. Water supply and garden hose required. * Please call us for any questions on our inflatable blue monster 18 foot double slide rentals in Cornelius NC, Lake Norman, Mooresville, & Davidson, North Carolina.